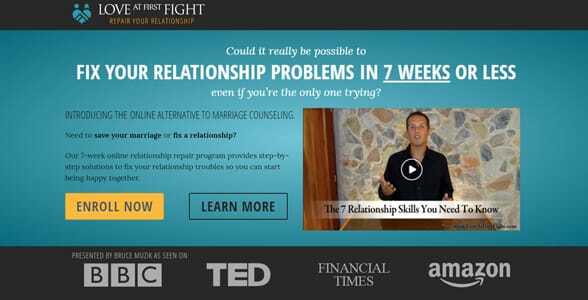 The Short Version: Trained relationship repair expert Bruce Muzik Bruce Muzik gives couples the tools to stop fighting and start connecting with one another. Because Bruce has been studying relationships for over 20 years, he can get to the heart of the issues between couples and recommend proactive and lasting solutions. 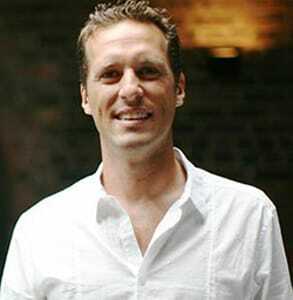 On his website, LoveAtFirstFight.com, he provides comprehensive resources for couples, including a seven-week online do-it-yourself relationship repair program, relationship counseling over the phone, and private weekend retreats in your home. His empathetic coaching style encourages couples to discuss their fears and transform their relationships. Committed partners can turn to Bruce for the knowledge, tools, and support to make sure their love goes the distance. Of course, it’s not so funny in times of conflict when one person wants to fight it out with raised voices and sharp words, while the other sits in increasingly tense silence. Generally, the men in my family surrender at the first flash of anger and try to sweep their partner’s concerns under the rug. But our hot tempers aren’t so easily swept away. 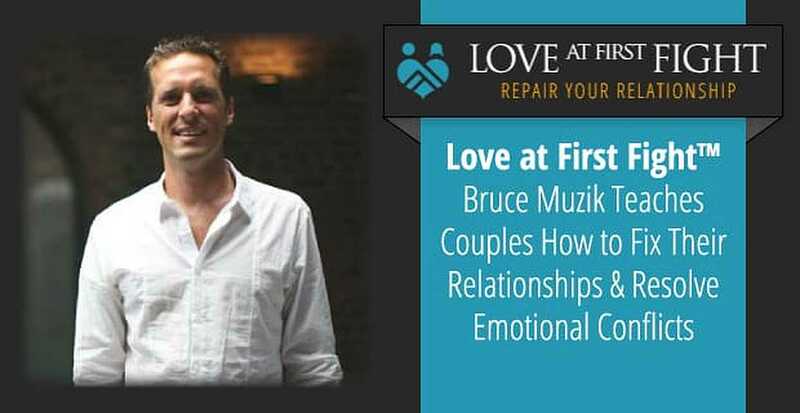 As a coach and counselor, Bruce Muzik empowers couples to work through emotional issues. Relationship repair expert Bruce Muzik calls this condition the Turtle and the Hailstorm. It’s a vicious cycle of conflict between partners. Even as the turtle retreats into a shell of silence and safety, the hailstorm feels unheard, unappreciated, and uncertain, and so it descends upon the turtle with force and fury. “The more the turtle retreats, the more the hailstorm chases,” he said. Bruce wants to show couples a more productive and healthful way to communicate with one another and handle conflict. He works closely with couples in embattled relationships and teaches people new ways to be together and fulfill each other’s emotional needs. Over the years, Bruce has developed a comprehensive array of resources for couples, including a home-study program, by-phone relationship counseling, weekend house calls, and free advice on his blog. Every session and article teaches people the fundamentals of good relationship-building. While in his 20s, Bruce suffered many heartbreaks and failed relationships. After four years of struggling with an on-again off-again relationship, he decided to do some soul-searching and discover why he was making the same mistakes in his love life. He began reading studies and looking at the science behind human relationships to understand what was going on. Bruce felt so moved and motivated by all he learned that he decided to start teaching it to others. So he left his successful career as an internationally acclaimed seminar leader and went back to school to get certified to help couples. He graduated at the top of his class, earning the highest marks in the history of the school, and began offering himself as a helpful resource to couples facing conflict. Bruce is an empathetic coach who helps couples feel safe opening up and dealing with their emotions. Now Bruce is an acclaimed relationship repair expert and marriage counselor with over 20 years of experience working with folks from all walks of life. In his coaching practice, Love at First Fight, Bruce advises couples over the phone, in training videos, and through weekend retreats. His in-depth programs give people the education they need to overcome all sorts of relationship challenges. He helps both individuals take conscious steps toward nurturing their love, understanding each other, and protecting the relationship. What makes Bruce effective as a relationship coach is the fact that so much of his advice is based on research, study, and experience. His proactive tips carry weight because they are grounded universal psychological truths. Once you understand the emotional needs of your partner, it’s easier to resolve conflict in positive ways. Bruce compared navigating relationship turmoil to driving a car. Anyone can do it, but no one is born knowing how to do it. People must first learn the tools and skills, or they risk many painful collisions in learning by doing. “It’s not that hard,” Bruce said, “but, until someone teaches you how to change gears, you’ll keep standing still.” Once the relationship repair expert teaches people the basics, the next steps become self-evident and couples feel empowered to take the wheel from there. “I help couples approach relationships from the perspective of how to unite as a team to take care of this valuable thing you’ve created,” Bruce said. In working with couples, Bruce has discovered that relationships undergo three essential transformations over time. The first stage is the Honeymoon period, which many people are well familiar with. The butterflies in the stomach. The longing to be together. This stage of bliss is a dream that can last for months or even years. Bruce’s coaching practice, Love at First Fight, teaches couples what to do when the honeymoon phase of a relationship is over. In the Power Struggle stage, however, couples wake up with a love hangover and wonder if they’ve chosen the right person to spend their lives with. Individuals in codependent couples feel like they’ve lost themselves. Estranged couples feel like they’ve forgotten their love. Both partners face new conflicts and need to learn how to maintain their autonomy while maintaining a strong and healthy relationship. A majority of divorces happen during this hard time. Through enlightening coaching work, Bruce ushers people into the final relationship stage, which he calls Mature Love. In this stage, couples feel at ease with one another. They’ve stopped trying to change one another and can accept each other’s imperfections and insecurities. This final stage is more stable than the Power Struggle phase and more durable than the Honeymoon period. Mandy and Jay were on the brink of divorce when they came to Bruce, who saw at once that they were facing a serious and difficult problem. Mandy wanted to leave the family religion of Mormonism, which would have lasting repercussions on their children, social standing, and family traditions. Jay felt threatened by her rejection of his beliefs and thought she was pulling away from him. Meanwhile, his wife feared she would be ostracized by her decision and that her husband would choose the church over her. Through in-depth sessions, Mandy and Jay voiced their concerns and talked about their issues. It all came to a head one day when Jay looked his wife in the eye and said, “You can become whatever you need to become. I will never leave you.” They both burst into tears and hugged. That assurance was what they needed to move forward together as a united front. Today, Mandy and Jay send Bruce a Christmas video every year to let him know they’re still together because of his helpful guidance. He finds it exceedingly gratifying to hear back from the people, like this Mormon couple, whose lives he touched. For turtles hoping to escape their shells and for hailstorms seeking sunny skies, Bruce Muzik is a welcome voice of reason offering the knowledge to move forward in healthier ways. Whether he’s working individually with a couple at a crossroads or sharing his insights in informational seminars to a larger audience, Bruce aims to give practical relationship solutions that can help couples solve both immediate and future problems. His insightful tips empower couples to build strong relationships, nurture stable families, and raise happy and successful children.